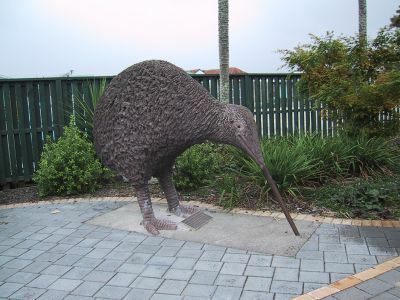 This page is about the centre of the town of Otorohanga, in the Waikato region of New Zealand. One of the first sights that greets you are two mighty, carved totems, depicting the eight Chiefs of the Ngāti Maniapoto Iwi (tribe). Carving is a strong skill prevalent in Māori culture. Carved by Mitchell Hughes of Ngāti Maniapoto. Maniapoto was the great fighting Chief and founder of the Ngāti Maniapoto Iwi (tribe). He was the son of Rereahu, direct descendant of the Tainui Waka. His leadership status is symbolised by the Korowai (cloak) he wears and the Tewhatewha (axe-like weapon) he holds in the "Kawau Māro" (triangular formation) position. Maniapoto had a pet eel, seen on the carving as embracing him. The eel would swim in the stream near Maniapoto's Cave, located south of Otorohanga. Three stalagmites symbolise the cave where Maniapoto lived, as well as depicting his three wives. The fourth stalagmite depicts his son Te Kawa Irirangi. The rope symbolises the Kingitanga (the King Movement) led by the first Māori King, Potatau Te Whero Whero. Carved by Martin Tuaupiki or Ngāti Mahuta. Words best used to describe Taonui are Tohunga Ahurewa (High Priest) and Tino Rangitira (Great Chief). The Toki Poutangata in his right hand denotes his Priestly status. He holds a Tokotoko (walking stick) in his left hand and wears a Korowai; portraying his Mana and his Rangatiratanga. His stance shows readiness and alertness, typifying a Maniapoto warrior. Taonui was noted for his Koauau (flute) playing. His own personal Koauau was fashioned from the bone of an unfortunate donor. A Koauau has been carved to adorn his neck. Carved by Martin Tuaupiki of Ngāti Mahuta. Te Wētini was a great warrior in battle and has been portrayed as such. His stance might seem to portray submission at first glance, but in fact he is ready and alert. Hence the raised upper lip and "Niho Whakatete" (gnarled teeth) grimace. Behind his back he holds a Tewhatewha to show proficiency in two-handed weaponry as well as a Wahaika to show his skill in close combat. The weapons are positioned to show humility; and only when provoked will they be used. The Taura (rope) throughout the pole represents "Te Aho o Tainui" (the genealogical strand from whom all Tainui tribes derive). Carved by Tahi Meihana of Ngāti Raukawa, Ngāti Rereahu. Wahanui holds a Tokotoko (walking stick) indicating his oratory prowess; and the Mana of his many riveting Whaikorero (speeches) to his own people and fellow countrymen. The Manaia head on his right shoulder symbolises the domain of Tumatauenga (God of War), and in contrast, the surrendering of arms to become a Christian, is depicted by the Bible in his left hand. Waiwaia, the name of the figurine on his left shoulder, holds the Taurahere Tangata (the rope that links humanity). This rope is the bond of our Tupuna (Ancestors) and the bond of our ties with all of creation. Carved by Korari Boyd of Ngāti Haua. Tūhoro was a descendant of Te Kanawa; and although he was a man of few words, he was indeed no less influential, "He Tangata Ki Tahi" (a person of one word). He lived mainly in Kawhia and Waitomo. When he found out that his land was being confiscated, he consequently moved to Otorohanga and remained there. Tūuhoro is depicted kneeling with a Patu (club) in his right hand above his head as a challenge to his descendants to seek and be proud of their origins. The spiralling form descending his left hand depicts not only Ngāti Manipoto's Whakapapa (kinship) links,but it also symbolises the Waipa River; a cherished waterway in Ngāti Manipoto. It can be seen weaving its way down the carving, uniting the other Chiefs below. Carved by Desmond Te Kanawa of Ngāti Maniapoto. "te Kanawa, ki te ringaringa nui hei whāwhā" (Te Kanawa, he with the strong hand). The eldest son of Te Kawa Irirangi II and Urunumia, Te Kanawa was a great warrior and a paramount Chief of Ngāti Maniapoto. He claimed direct lineage to his ancestor Hoturoa, commander of Tainui Waka (canoe), and he was a firm supporter of Potatau Te Whero Whero as first Māori King. Known to have used his Taiaha (quarter staff) to pole-vault himself out of danger, Te Kanawa is shown holding his Taiaha in the "Pahekeheke Katau" position, a posture of defence. He also holds his Wahaika (short club) in the "Hue Taepo" position, as a direct challenge to those before him to uphold the Kingitanga movement. Carved by Albert Tipene of Ngāti Tuwharetoa. Te Hauāuru was a descendant of Te Kanawa and his first wife Waikohika who also supported Potatau Te Whero Whero as the first Māori King. During a conflict with another Iwi intent on raiding and revenge, Te Hauāuru was given the only gun held by a person of Ngāti Maniapoto at the time. Te Hauāuru helped in defeating this onslaught by shooting the warrior who had the only gun in the raiding party. Further, it is said that Te Hauāuru was also able to avenge the death of his grandfather Maungatautari, formerly called Te Hurinui who was killed some time earlier by the same Iwi, by shooting the enemy's Chief. Carved by Tahi Meihana of Ngāti Raukawa, Ngāti Rereahu. Like Te Hauāuru, Te Haupōkia was also a descendant of Te Kanawa and his first wife Waikohika. Prior to the Kingitanga movement Te Haupōkia had attended the Treaty of Waitangi meetings at Port Waikato and Kawhia along with his father Nui Tone Te Pakaru; ultimately becoming a signatory to the Treaty of Waitangi. Te Haupōkia also fought alongside Rewi Maniapoto at the Battle of Orakau. He later travelled to Australia to help set up the flax trade. This is depicted on the carving by the Harakeke (flax) growing at his feet and the Kiekie hanging down by his up-raised hand. Off to the rear left of the town green are a pair of large sculptures. 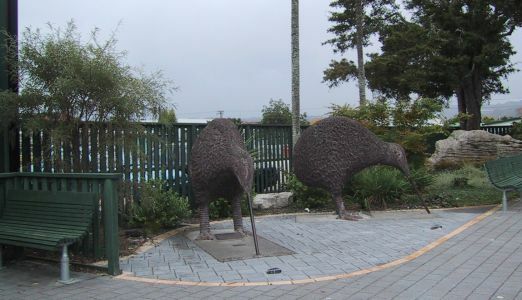 This pair of Kiwis were sculpted by Robin Coleman, of Marton. "To the People of the Otorohanga District. In appreciation of the community support of our business over the last 25 years. 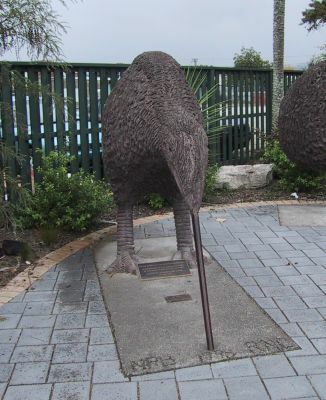 Otorohanga is also home to the Kiwi House - a choice destination to see the lovely birds first hand. 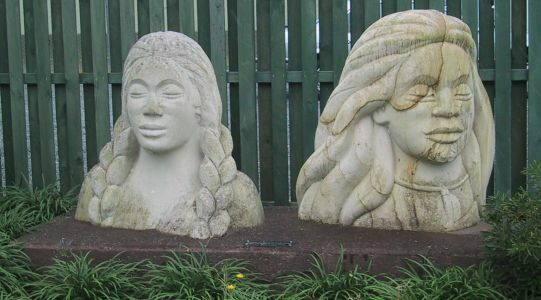 On the other side of the green, the busts of Parehuia and Kahira are found. Parehuia and Kahira Maratini were two sisters, descendants of Ngāti Matakore. Parehuia wore a moko (tattoo) on her chin depicting her female seniority in their family. The two sisters were the original owners of this site which was called "Waikowhitiwhiti". Neither sister had children of their own. It is the wishes of their great-great-grand nieces and nephews to have them symbolically depicted on this, their traditional whenua (land).